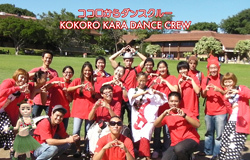 The students from KCC (Kapi’olani Community College) will perform a dance program that promotes smiles called “Kokorokara Dance” with Minami Sasuga who is a famous dancer and choreographer in Japan. This program is created by her. It is enjoyable, casual, and easy for any age generation.